During its iPad mini launch event today Apple updated many members of its Mac lineup. The 13-inch MacBook Pro, iMac and Mac mini all got updated today. For the iMac and Mac mini, Apple introduced a new feature that I honestly expected it to debut much earlier: Fusion Drive. The idea is simple. Apple offers either solid state or mechanical HDD storage in its iMac and Mac mini. End users have to choose between performance or capacity/cost-per-GB. 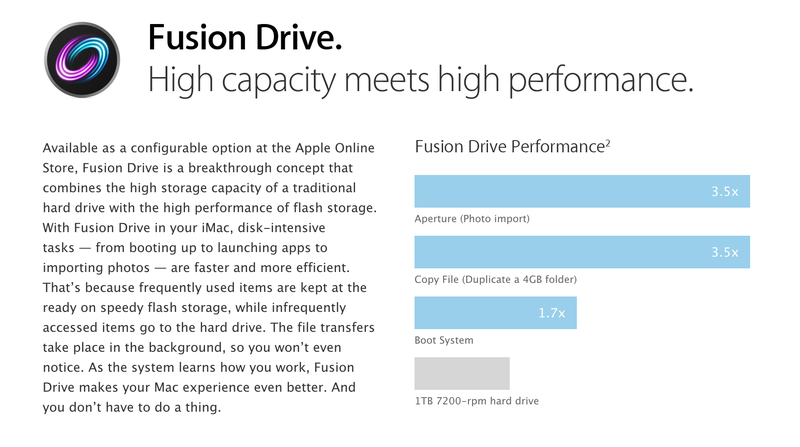 With Fusion Drive, Apple is attempting to offer the best of both worlds. The new iMac and Mac mini can be outfitted with a Fusion Drive option that couples 128GB of NAND flash with either a 1TB or 3TB hard drive. The Fusion part comes in courtesy of Apple's software that takes the two independent drives and presents them to the user as a single volume. Originally I thought this might be SSD caching but after poking around the new iMacs and talking to Apple I have a better understanding of what's going on. For starters, the 128GB of NAND is simply an SSD on a custom form factor PCB with the same connector that's used in the new MacBook Air and rMBP models. I would expect this SSD to use the same Toshiba or Samsung controllers we've seen in other Macs. The iMac I played with had a Samsung based SSD inside. Total volume size is the sum of both parts. In the case of the 128GB + 1TB option, the total available storage is ~1.1TB. The same is true for the 128GB + 3TB option (~3.1TB total storage). By default the OS and all preloaded applications are physically stored on the 128GB of NAND flash. But what happens when you go to write to the array? With Fusion Drive enabled, Apple creates a 4GB write buffer on the NAND itself. Any writes that come in to the array hit this 4GB buffer first, which acts as sort of a write cache. Any additional writes cause the buffer to spill over to the hard disk. The idea here is that hopefully 4GB will be enough to accommodate any small file random writes which could otherwise significantly bog down performance. Having those writes buffer in NAND helps deliver SSD-like performance for light use workloads. That 4GB write buffer is the only cache-like component to Apple's Fusion Drive. Everything else works as an OS directed pinning algorithm instead of an SSD cache. In other words, Mountain Lion will physically move frequently used files, data and entire applications to the 128GB of NAND Flash storage and move less frequently used items to the hard disk. The moves aren't committed until the copy is complete (meaning if you pull the plug on your machine while Fusion Drive is moving files around you shouldn't lose any data). After the copy is complete, the original is deleted and free space recovered. After a few accesses Fusion Drive should be able to figure out if it needs to pull something new into NAND. The 128GB size is near ideal for most light client workloads, although I do suspect heavier users might be better served by something closer to 200GB. There is no user interface for Fusion Drive management within OS X. Once the volume is created it cannot be broken through a standard OS X tool (although clever users should be able to find a way around that). I'm not sure what a Fusion Drive will look like under Boot Camp, it's entirely possible that Apple will put a Boot Camp partition on the HDD alone. OS X doesn't hide the fact that there are two physical drives in your system from you. A System Report generated on a Fusion Drive enabled Mac will show both drives connected via SATA. The concept is interesting, at least for mainstream users. Power users will still get better performance (and reliability benefits) of going purely with solid state storage. Users who don't want to deal with managing data and applications across two different volumes are still the target for Fusion Drive (in other words, the ultra mainstream customer). With a 128GB NAND component Fusion Drive could work reasonable well. We'll have to wait and see what happens when we get our hands on an iMac next month. What I wonder is what happens when one of the drive fails? Say the SSD fails. If it's was a cache and they did things right, it wouldn't matter if the SSD failed (as long as the system realized the SSD had failed). Whereas in Apple's case it's not a cache. From the description it seems to me that you will lose data if either of the drives failed. Well, once it's been written to the write buffer, I assume the OS will decide whether or not to keep it there or move it to the rotational HD later.